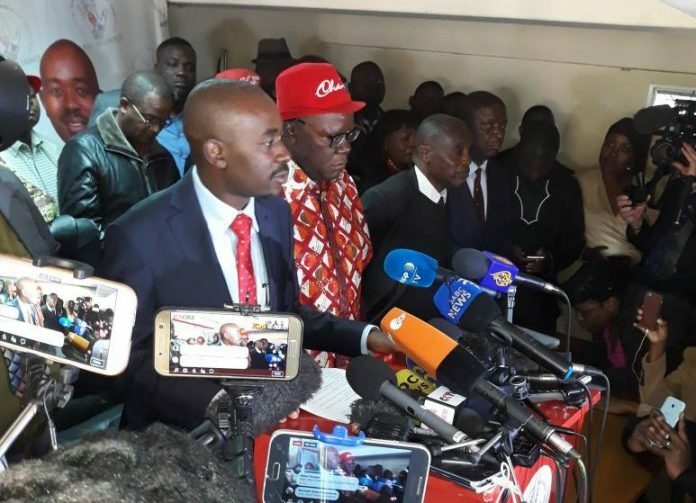 MDC Alliance presidential candidate Nelson Chamisa announced his seven-party coalition will participate in Monday’s election, despite earlier threats not to take part unless his demands were met. Chamisa is President Emmerson Mnangagwa’s most formidable opponent, with a recent poll giving the incumbent a narrow 3 percentage point lead on the challenger. With five days to go before the vote, Chamisa told journalists his alliance would still push for some concessions from the Zimbabwe Electoral Commission (ZEC). At a meeting with political parties on Tuesday, ZEC only acceded to use of the old ballot box design, abandoning a proposed new one which would have allowed polling officers to see voters marking the ballot. ZEC has repeatedly told the MDC Alliance that its demands fall outside the limits of the law. The opposition has complained about lack of coverage by state broadcaster, ZBC, as well as the blatantly biased coverage of Zimbabwe Newspapers titles. On Wednesday, Chamisa specifically mentioned The Herald and The Sunday Mail. Described by Chamisa as a ‘deadlock issue’ the ballot paper is central to his alliance’s pre-poll demands. He said the MDC Alliance wants full disclosure of “the source, status, traceability and security of the ballot paper”. Chamisa added that the MDC Alliance had, as of Wednesday, seen “no evidence of how many ballot papers were printed, who printed them, where they were and their security.” Although Chamisa did not talk about it, opposition circles have, since the 2013 election, speculated about the use of a ‘special’ ballot paper which allows the migration of a voter’s mark to another part of the ballot paper. The MDC Alliance says it would have wanted to agree with ZEC, and other parties presumably, on the “composition, deployment and placement” of the nearly 11,000 polling stations to be used for Monday’s election. Chamisa did not elaborate, but the opposition officials have repeatedly expressed fears ‘sensitive’ election material such as ink, “in particular the silver nitrate composition”, voting pens and seals could all be part of ZANU-PF’s election rigging scheme. In elections since 2000, the opposition complained about the voters roll, which they alleged was a central tool in ZANU-PF’s poll rigging. The creation of a new voters roll, capturing biometric data, was expected to go a long way in eliminating these concerns, However, the new roll, with some 5.6 million voters registered between September and June this year, has remained a major point of dispute. “The issue of the biometric voters roll is also an issue in question, which again undermines the credibility of the process and almost sets this election on the path to being determined a flawed election,” Chamisa said. The MDC Alliance has been noticeably muted in its response to an audit of the roll done by a group of sympathetic volunteers. A separate audit, done by an independent watchdog did not find major anomalies with the roll. Next articleDid the MDC blink, again?